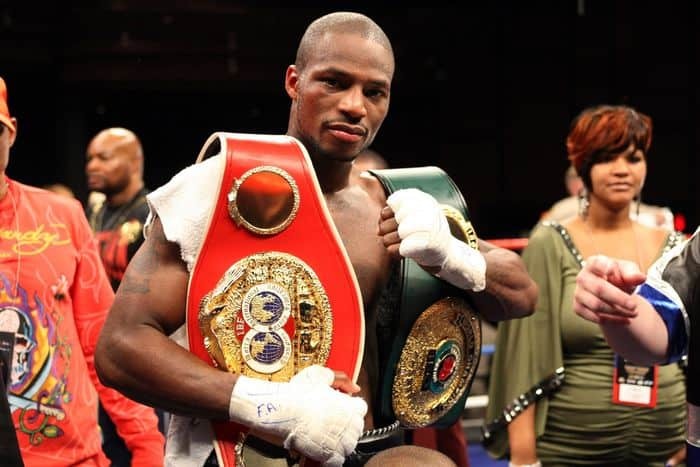 Chad Dawson (27-0-1, 17 KOs) of New Haven, Conn., the new IBF-IBO light heavyweight champion as of Oct. 11, proved to be a more effective fighter against Antonio Tarver (27-5, 19 KOs) from Tampa, Fla. They fought before a crowd of 2,300 at the Pearl Theater in the Palms Resort and Casino in Las Vegas. Dawson, Gary Shaw’s fighter, who was trained by Eddie Mustafa, worked out eight weeks at Mt. Charleston, just outside of the city. The young fighter said he was prepared for the hard body shots of Tarver. Dawson executed speed and power throughout the rounds and during all 12 rounds. At the end of the press conference, Tarver gave credit to Dawson for winning the fight and said he was ready for a rematch now. Dawson, who gave up his WBC light heavyweight title to fight Tarver, said he was fine with a rematch with him. According to Tarver, if a rematch is granted by Showtime and he loses, he will retire. In another major Showtime championship fight, but on the other side of the globe in Berlin, Germany, Vitali Klitschko (36-2, 35 KOs) of Kiev, Ukraine, took on Samuel Peter (31-2, 23 KOs) of Las Vegas, Nev., for the WBC heavyweight championship in what was touted to be the most compelling match-up in years. It fell short of that. The fight, held in the 02 World Arena in front of more than 12,000 fans, was lopsided with Klitschko winning every round. After his layoff for four years due to a damaged knee, Klitschko showed no signs of weakness. He executed left jabs and overhand rights with ease against Peter. Although Peter managed to become more aggressive in the later rounds, working on his opponent’s body, he just wasn’t aggressive enough to break through Klitschko’s defense. In fact, Peter was defeated mentally and physically when he quit at the end of the eighth round. His trainer, Stacy McKinley, had Peter cutting down trees to prepare for this fight, but Peter didn’t show any signs of new boxing techniques against Klitschko. He didn’t fight Klitschko on the inside and he was mainly a sitting duck for the champion. So after a four-year layoff, Klitschko comes back to regain his WBC title. On the Tarver-Dawson undercard, a very promising fighter, Said El Harrak (3-0, 1 KO) of London, England, fought an exciting junior welterweight bout against Alex Stringer (0-3-1, 0 KOs). Harrack knocked out Stringer in 2:18 of round one. Anthony Dirrell (13-0, 3 KOs) of Flint, Mich., won over Andy Mavros (7-2, 2 KOs) of Vancouver, Canada. Dirrell shows a lot of promise in that he has a strong left hook and is a good combination puncher. He is one of Gary Shaw’s fighters. Archie Marquez (4-1, 4 KOs) of Albuquerque, N.M., knocked out Samuel Morales (4-0, 1 KO) of Saint Paul, Minn., in 42 seconds of round four of the lightweight bout. 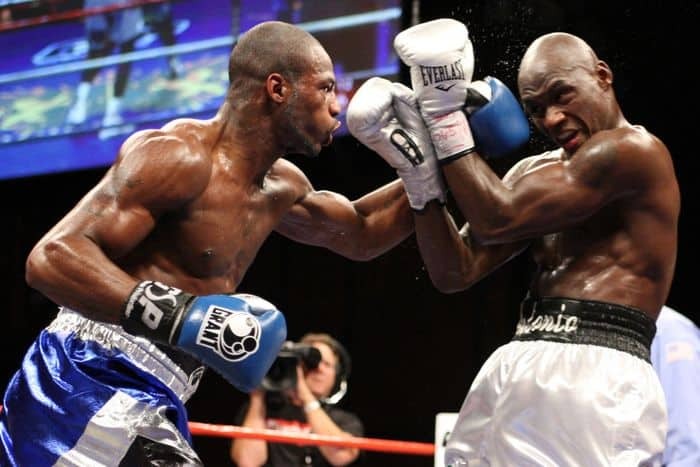 Ricardo Williams (13-2, 7 KOs) of Cincinnati, Ohio, fought and won a hard, eight-round welterweight bout against Dairo Esales (32-15, 25 KOs) of Miami, Fla.
Chris Avalos (7-0, 5 KOs) of Lancaster, Calif., in an eight-round, bantamweight bout defeated Ernie Marquez (8-5, 3 KOs) of Fort Morgan, Colo.
Tarver and Dawson are both family men who bring good sportsmanship to the sport. The same applies for Klitschko and Peter. Shaw says he plans to do more boxing events at the Palms, as well as at other venues owned by the Maloof family.